You’d think it would be hard to stick your foot in your mouth when writing an innocent article on hummus. But this is Food Babe (Vani Hari), so you’d be thinking incorrectly. Food Babe waxes poetic on ingredients found in packaged hummus. If you’ve been following my series on debunking Food Babe then you know the yellow highlighting is a clue she’s said something she’s going to regret. For those of you taking notes at home, write this down: Vani claims that (1) potassium sorbate causes skin allergies and (2) sodium benzoate combined with vitamin C can cause leukemia. 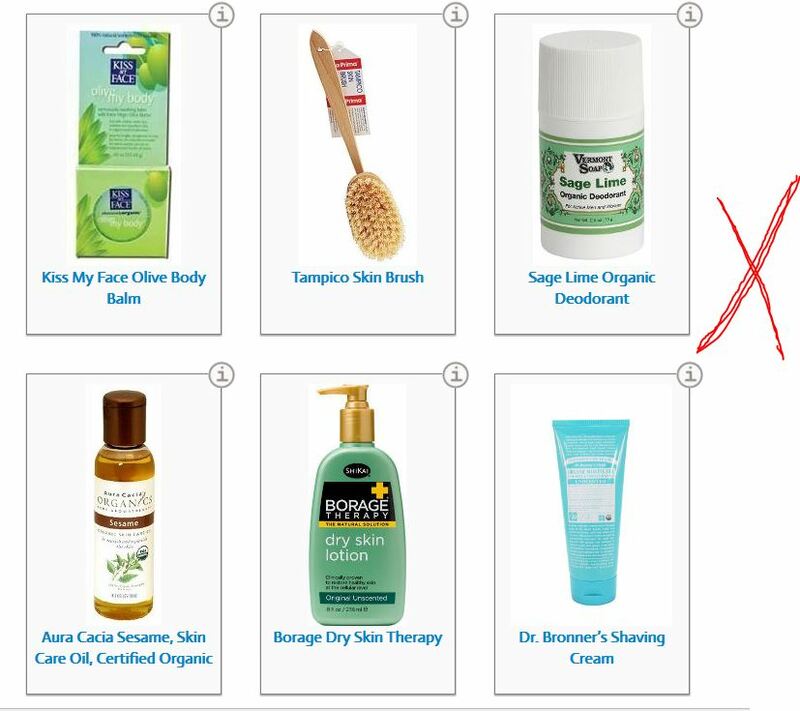 Note that I’ve highlighted the Amazon.com affiliate ID embedded in Food Babe’s web page. She cashes in every time you buy via her site. Unfortunately Avalon Organics doesn’t list the ingredients on Amazon.com,2 but they do on their own web site.3 You can click on the following image to enlarge the list of ingredients, or I’ll zoom in for you in a moment. Wake the kids and phone the neighbors! Potassium Sorbate? Sodium Benzoate? But she puts it on her face every night? And she earns a sales commission when you buy it via her web site! But… but… there’s sodium benzoate in the cleansing milk she’s selling–and guess what else is in there? … and CoQ10 Facial Cleansing Milk contains sodium benzoate and Vitamin C. Oh! And Food Babe earns a sales commission when you buy this cleansing milk via her web site. When you make extraordinary claims you need to bring extraordinary evidence to the table. Food Babe disappoints in a major way, never listing a single source to back up her asinine comments on sodium benzoate and leukemia. As far as potassium sorbate… there are a few reports of contact dermatitis.8 But if it’s so bad, why is this woman washing her face in it every night and earning a sales commission in the act? In science, the burden of proof lies upon the person making the claim. If Vani Hari believes these ingredients are dangerous, it’s up to her to prove they are. The fact that she makes money selling items with those same ingredients is unconscionable. If you’d like to read more about the non-dangers of sodium benzoate and potassium sorbate, you might start with the toxicity summaries in the U.S. National Library of Medicine’s PubChem database entries for these two compounds.7,8 If you’re a Food Babe Army member looking for gloom and doom, you’re going to be very disappointed. 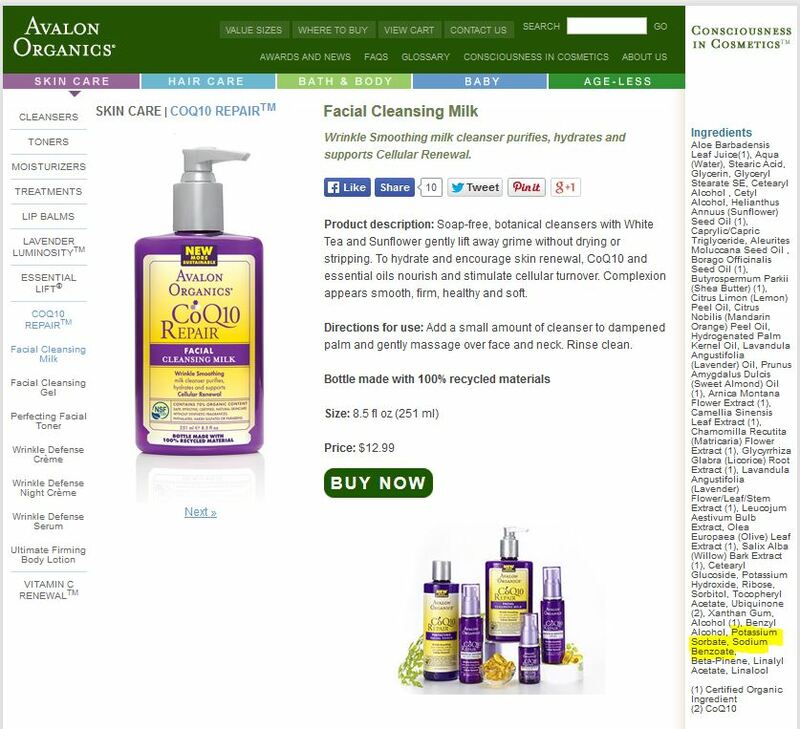 Here’s what you’ll find… nothing about Avalon Organics Facial Cleansing Milk appears dangerous in any way, despite what Vani Hari claims about its ingredients. Use it on body parts that would make your grandmother blush. Just please don’t buy via the affiliate links on Food Babe’s web site. 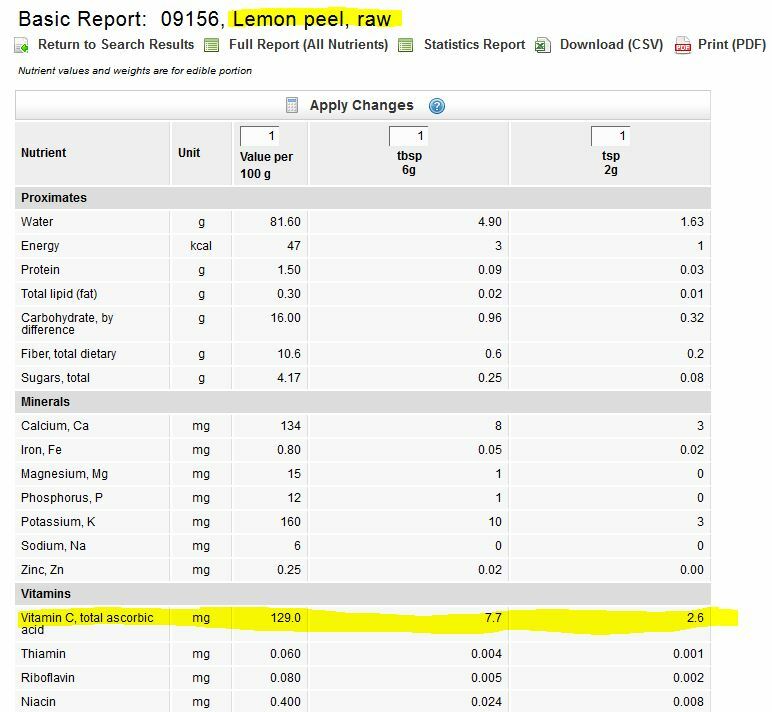 Lemon peel nutritional/chemical breakdown courtesy USDA. Image is in the public domain as a work of the U.S. government. “The Scream” by Edvard Munch. This is a faithful photographic reproduction of a two-dimensional, public domain work of art. The work of art itself is in the public domain for the following reason: Public domain. The author died in 1944, so this work is in the public domain in its country of origin and other countries and areas where the copyright term is the author’s life plus 70 years or less. This article has been retracted due to an error (mine) in the ingredient list. While I work hard to ensure accuracy, I’m also human. I got this one wrong. I’m grateful to the two readers who contacted me to notify me of the error. Your diligence is appreciated. I also apologize to Ava Anderson. This is a company with a great reputation for providing safe cosmetics. This fact was pointed out in the original article but bears repeating here. Regular readers of my Food Babe “Dangerous” series know that I always stress that the product being discussed is actually completely safe, and that was certainly the case for any Ava Anderson product mentioned. Readers unfamiliar with the style of these articles might not have made it to the conclusion section where I reveal that experts in science and chemistry agree everything in the product is safe. But tying this company’s product to a list of ingredients that was not their own could lead to confusion. So I’ll reiterate–there’s nothing to fear from this company’s product. Because I criticize certain other blogger/activists for quietly deleting the evidence when they’re shown to be wrong, a deletion of the page itself would be uncalled for. In place of the original, retracted content, I’m leaving this apology. Admit your mistakes. Apologize. Work harder next time. That’s my plan going forward. (Updated 22 Oct 2015 10:30pm) When caught in the act, Vani Hari occasionally quietly pulls a product from her lineup without explanation. She appears to have done that with the Tarte Blush described in this article. Below is a screen snapshot of her shopping page, taken today, with a big red “X” marking the spot where the Tarte Blush was removed. Would she make the same mistake twice? Yes. And this one is mind boggling. With that out of the way, it’ time to go shopping at Food Babe’s online store. Tarte Blush on FoodBabe.com. Note the encrypted Amazon.com affiliate link. Click image to enlarge. You can see from the encrypted Amazon.com affiliate link that she earns a sales commission if you buy this item. But… I wonder what’s in the blush? My apologies, but Tarte goes at this a little awkwardly. They’re so proud of their ingredients that they list them first. You must choose an ingredient from a list to see all the products that contain it. In other words, you can’t just click a product to see what it’s made of. 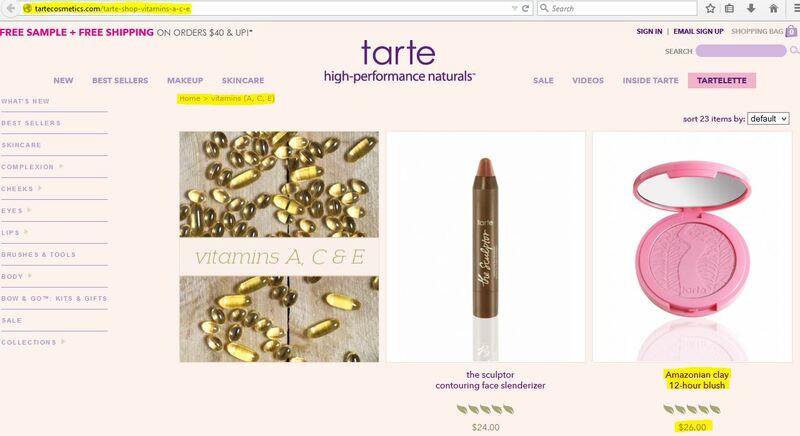 You must scan a web page for “vitamin A”, then click “vitamin A” to learn where Tarte uses it. Geez! … but how about the specific product recommended by Food Babe–the Tarte Blush? Only $26 for a product that Food Babe repeatedly says will give you cancer. What percentage of that $26 goes to Vani Hari when you purchase via her web site? 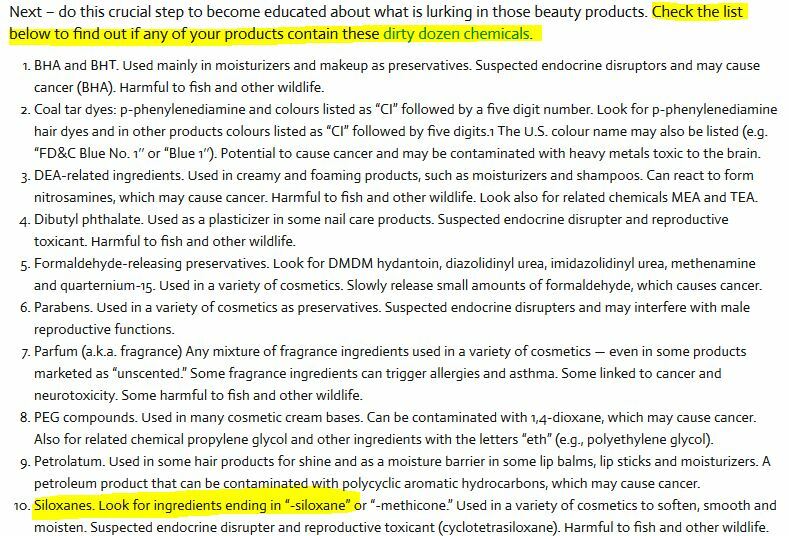 Vani Hari falsely says that retinyl palmitate (vitamin A) will give you cancer if you apply it to your skin and go out in the sun.2,3 But she’s earning a sales commission on a cosmetic that contains vitamin A. So Hari is hypocritical. If you buy this blush from her web page and wear it in the sun, she, by her own standards, is making you cancer-prone. Experts say there’s no proof whatsoever that Tarte Cosmetics Blush–or any other product containing retinyl palmitate–will give you cancer. Buy from Tarte with wild abandon, and feel safe in doing so. But please don’t buy via affiliate links on Food Babe’s web page. In “How To Find The Best Natural Mascara That Actually Works,”1 Vani Hari (the “Food Babe”) serves up her usual plate of scare tactics, smearing market leaders in the cosmetics industry while offering up a buffet of “safe” alternative mascaras. 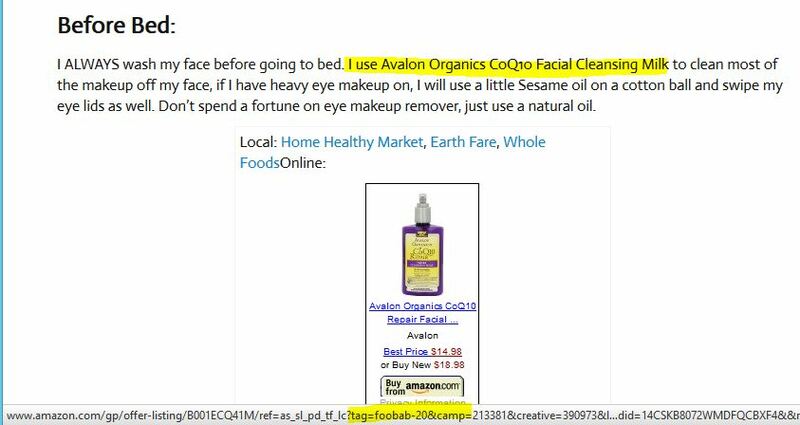 You click, and Vani cashes in — Physician’s Formula Mascara and Food Babe’s encrypted Amazon.com affiliate ID (click to enlarge). –Physician’s Formula mascara ingredients (click to enlarge). Did you see the titanium dioxide? So… “4-Mel” might possibly cause cancer in humans and is known to cause cancer in lab animals. Scientists call these type of chemicals “group 2B carcinogens.” Please keep that term in mind. It will be important later. Food Babe wants us to avoid group 2B carcinogens. Do you know what else is in this group? Read it with me, Food Babe: “Titanium dioxide is possibly carcinogenic to humans.” And “there is sufficient evidence in experimental animals for the carcinogenicity of titanium dioxide.” Didn’t you just say the same thing about Starbucks? It gets worse: in an article on sunscreens, Hari strongly recommends seeking out and buying products that contain titanium dioxide.11 You probably won’t be surprised to learn she’s more than happy to sell you titanium dioxide-laden products via her web site. If you’re a Food Babe Army member thinking “wait a minute, I’m drinking the Starbucks but only putting the titanium dioxide in my eyes and on my skin,” I’m afraid you’re out of luck. In upcoming article, we’ll be looking at how Food Babe disparages a group of chemicals known as parabens, commonly used in cosmetics. She says such cosmetics are dangerous to use on your skin, but she recommends eating parabens. Seriously. So, a question: why is it wrong to buy a group 2B carcinogen from Starbucks but OK to buy it from a link on Food Babe’s web page? I’d invite you to ask Vani Hari that, but she deletes such questions from social media and bans the people who ask them. Before you panic, please read the exciting (?) conclusion. There’s something about “group 2B carcinogens” you really need to know. Emphasis in the above quote is mine. “Limited evidence”… I’m not an expert in the field, but I’m not really too worried about titanium dioxide. Or Starbucks’ latte. And Vani Hari is a hypocrite. If she’s going to wage war against Starbucks, she needs to toss the mascara in the garbage can. And while we’re at it… there are also “group 1” carcinogens. Far more dangerous than group 2B (4-Mel, titanium dioxide, etc. ), group 1 members are known to cause cancer. Why do I mention this? 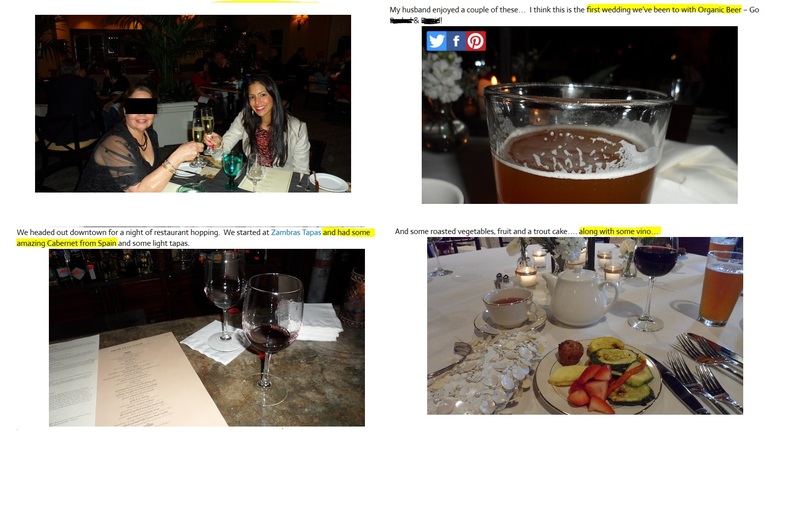 Food Babe and Group 1 carcinogen alcohol (click to enlarge). Amazon.com and Food Babe screen snapshots used in accordance with Title 17 U.S.C. Section 107, commonly known as “fair use law”. This material is distributed without profit with the intent to provide commentary, review, education, parody, and increase public health knowledge. Fowls from WikiCommons user “Rex“, used under Creative Commons Attribution-Share Alike 3.0 Unported license. Image owner does not necessarily agree with or support the views expressed by the author. If you read the first and second articles in this series, you know the drill by now: I present an article by Vani Hari (the “Food Babe”) in which she slanders a product; she then pushes an alternative for which she receives affiliate commissions. In turn, I use her very same “safety” rules to show her own substitute products are dangerous. The alternatives usually contain the same ingredients. Why yes, it’s vitamin A (retinyl palmitate)! But… but… Vani Hari told us that putting vitamin A on your skin and going out in the sun could speed the development of skin tumors and lesions! Wouldn’t you at least expect a warning from her to not go out in the sun after using Kiss My Face Moisture Shave? Food Babe doesn’t link to any scholarly resource when making her cancer claim. Her source is “The Environmental Working Group” (EWG) who, not surprisingly, has a “Sun Safety Store” on Amazon.com. Look, folks, if you’re going to fall for this type of shill activity, please contact me for instructions on sending me your life savings. Seriously. The point remains: Food Babe claims vitamin A causes cancer if you rub it on your skin and expose your skin to sunlight. And she’s trying to sell you a product loaded with vitamin A. “Kiss My Face” is as safe as any other product on the market. Buy it with wild abandon. But please don’t buy it via a link on Food Babe’s web site. Amazon.com product and Food Babe screen snapshots are used in accordance with Title 17 U.S.C. Section 107, commonly known as “fair use law”. This material is distributed without profit with the intent to provide commentary, review, education, parody, and increase public health knowledge.